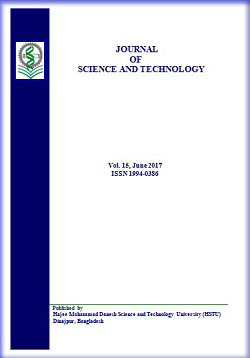 The Journal of Science and Technology (ISSN 1994-0386) is an official journal of Hajee Mohammad Danesh Science and Technology University. The journal has an international scope with broad constituency of scientists in the life and social sciences, basic sciences, engineering, business administration and humanities, and annually publishes original articles, review papers and technical notes. A number of editorial members guide manuscripts through the review process and properly formatted papers are accepted for publication. Authors from all concerns of science and technology are requested to submit manuscripts for publication to this journal. We ensure speedy responses to authors and rapid publication, with all papers being reviewed by at least two independent referees. Reasonable printing and publication charges. Best research paper awards in each journal issue.